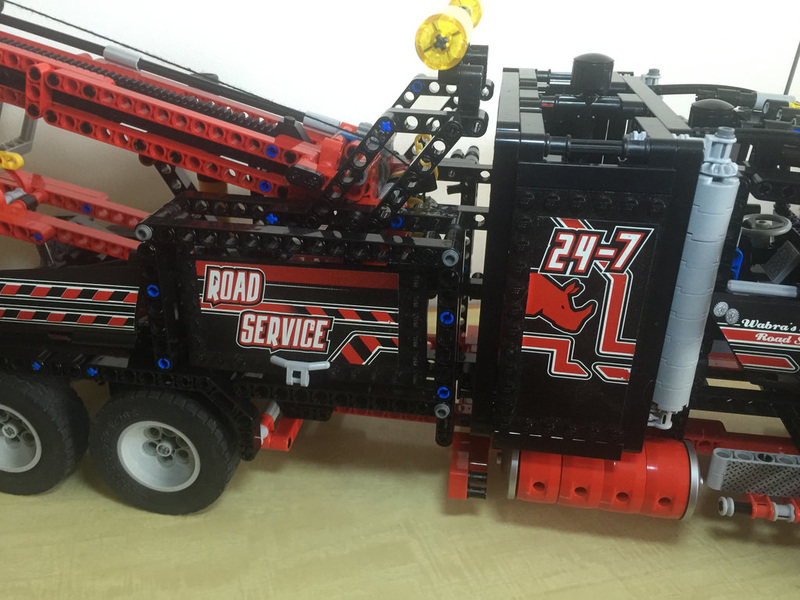 Of all the sets I’ve built from Technic (and admittedly it’s not that many), 8285: Tow Truck easily takes the title of biggest set. It’s enormous, and I really didn’t want to give it back to the owner! With a big lifting boom, pneumatic jack and more, it’s a monster of a set. 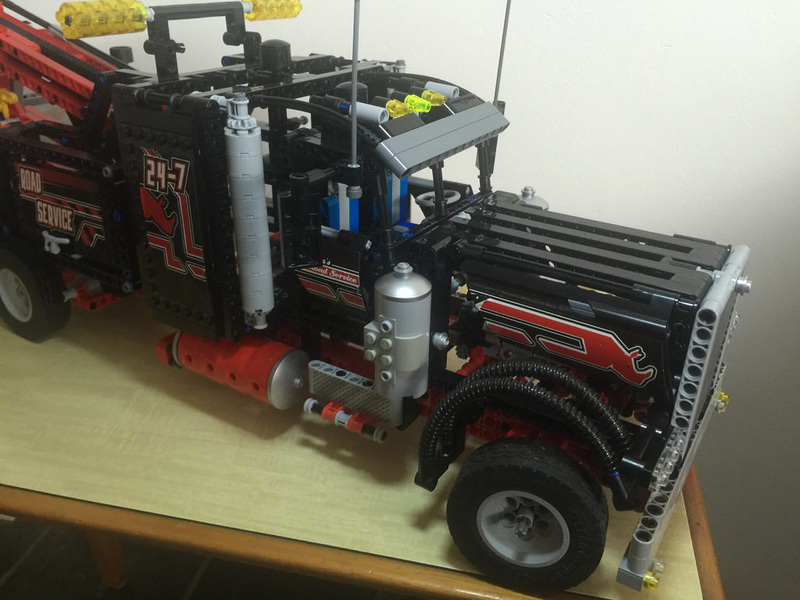 It’s actually the second largest Technic set by piece count. 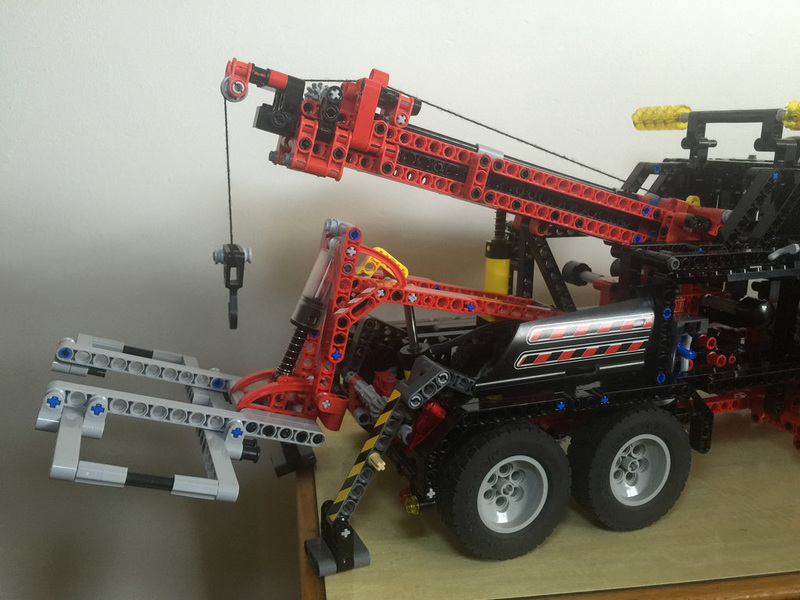 It’s tied at second place with 8258: Crane Truck, with the winner being 2005’s 8421: Mobile Crane at 1884 pieces. There’s nothing unique to this set, but a few things come close – the four round silver dishes that are at the ends of the fuel tanks are also seen in 10187: Volkswagen Beetle, and there’s also a pneumatic tube that’s in another set. There’s lots of black in this one, and a fair bit of lacquered chrome – it’s not super shiny, but it’s not dull grey either. 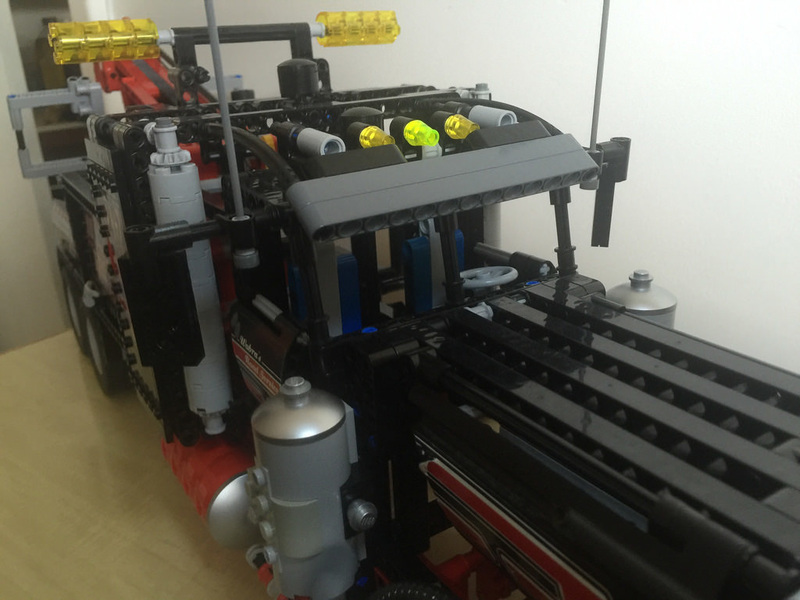 Lots of big panels feature in this set, with the standard Technic range included. There’s a bit of red as well. 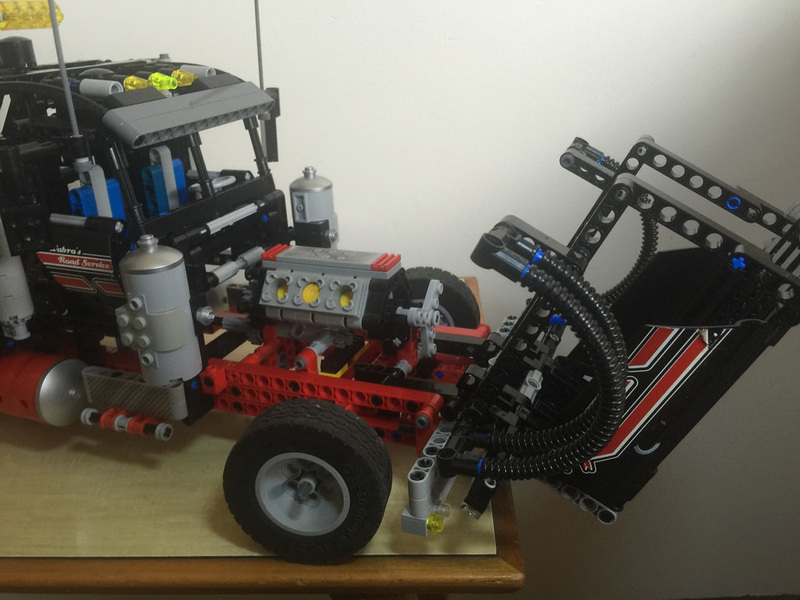 The brilliant parts of this set I think has to include the 10 tyres. They’re far from unique, but they’re massive. Then there’s the crane hook – a nice metal one, the pneumatic elements, with the damper, pump cylinder, and valve switch, and of course, two extra long 32M Technic axles. There’s a bit you can do with this set. It’s great for driving around the floor, and trying to lift whatever you can, but the one glaring issue with it is that I don’t think there’s many sets that would be able to be picked up by the lift. It’s a very wide lift, so maybe there’s a couple, like 10242: Mini Cooper, but I can’t imagine there’d be many. The pneumatic elements of the build are pretty great. 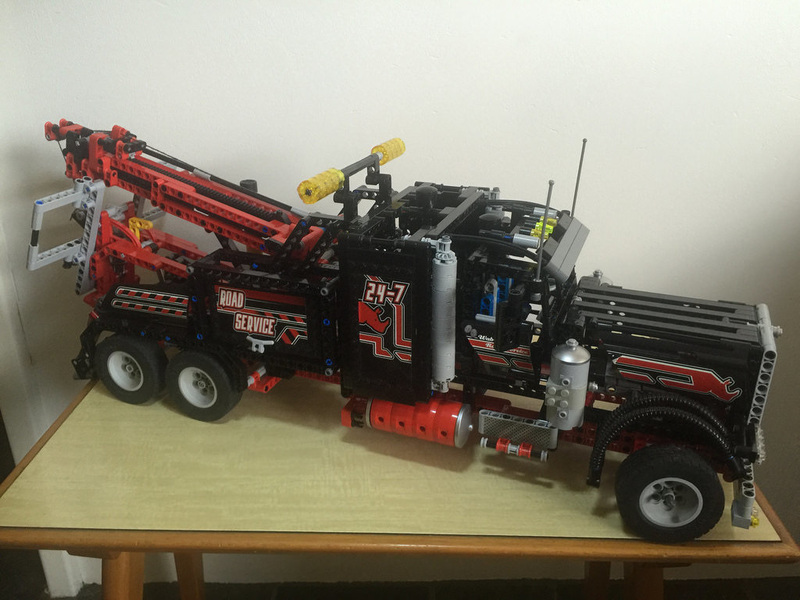 I haven’t come across pneumatic stuff for a very long time – not since my childhood, and even then, I can’t remember the set they came from, but it’s great to see here. I also like that the engine cover can lift forward to reveal the engine inside. It’s a little small, but still cool to be able to do that. I would have loved to have seen some power functions in this set. There’s plenty of room for it! The build experience for this set is great. It takes a long time to put it together – I worked on it each night for a few weeks, but it was brilliant fun. Seeing the set grow and grow was fantastic. It’s never a boring build. Once the two halves of the chassis are pieced together, the size becomes apparent. It’s really big. The cab gets added, followed by the housing for the mechanics, then it’s the boom, tail lift, and a few extras dotted around the place. I was really excited to get stuck into it each night. Great fun! 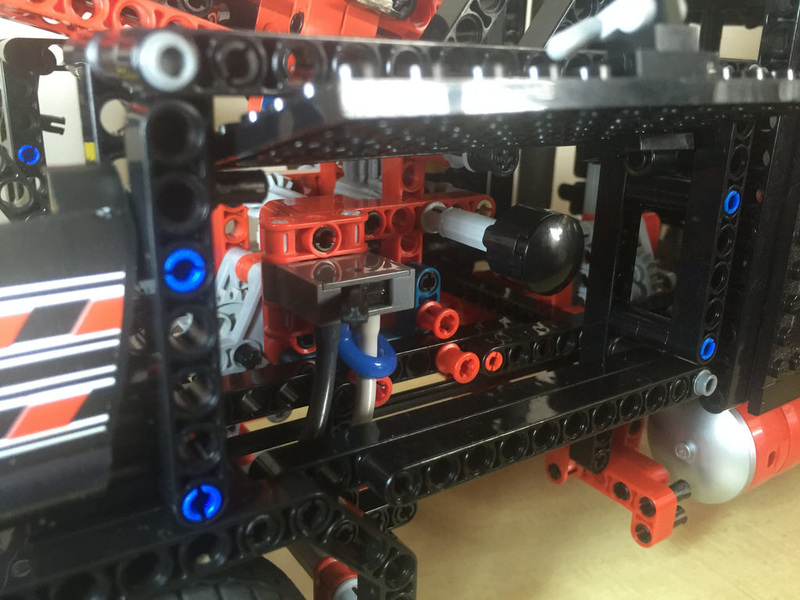 It can be tricky routing the hoses through the chassis in the right way, but I got there in the end. Picking it up wasn’t too bad, but I noticed that the exhaust pipes were a little flimsy. They tended to break in half a bit. This is an imposing beast of a build! It would look spectacular on a shelf, and is oozing that “wow” factor. I love the silver grille at the front, the big tanks near the cab, and of course that monster boom. It’s great. I was missing a few elements, so I couldn’t attach some of the panelling, but everything else was pretty much there. Bottom line – it looks brilliant. I honestly can’t fault it. Next week I’ll be taking a look at the sets I’m able to keep for myself! Finally! I’ll be starting off with some ExoForce sets – specifically 7706: Mobile Defense Tank. It’s a unique one.